State and local government committee members, veterans, project members at the Minnesota State Capitol on March 15 to testify at the Hmong/Lao Memorial Hearing. 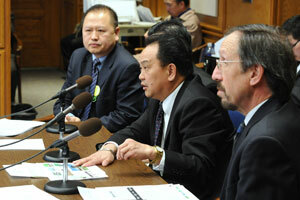 ST. PAUL (March 15, 2013) — Legislation authorizing state funds for the design and construction of a Hmong-Lao veterans commemorative memorial on Capitol grounds passed successfully through its first committee this week. The bill’s author, Senator Foung Hawj (DFL-St. Paul), was joined at the hearing by more than 20 veterans of the war in Laos who were allied with American forces during the Vietnam War. The project has a new life after several efforts for previous memorials have been discussed at the State Legislature over the past 30 years. Minn. State Sen. Foung Hawj (DFL-67), left, listens as Hmong Special Guerilla Forces veteran Xang Vang testifies at a hearing on behalf of the Hmong/Lao memorial project, with CAAP Board member Paul Mandell at right. “I know many of the veterans here today. Many served with my father in the war. The older generations however are gone and we need to honor those still here now,” said Sen. Hawj. Representatives from the project’s planning committee and Paul Mandell, Principle Planner & Zoning Administrator for the Capitol Area Architectural and Planning Board, also testified in support of the memorial. Plans for this Hmong-Lao veterans memorial began about five years ago with some state funds going to choosing the memorial location and picking a design. However, a lack of non-state funds froze any further action. The new legislation requests $500,000 in state funds in addition to the $150,000 in non-state resources. Sen. Hawj, project organizers, and CAAP Board member Paul Mandell, are confident that the group raising the non-state funds will be successful. The bill was recommended to pass on a unanimous voice-vote and was re-referred to the Finance committee for further consideration.